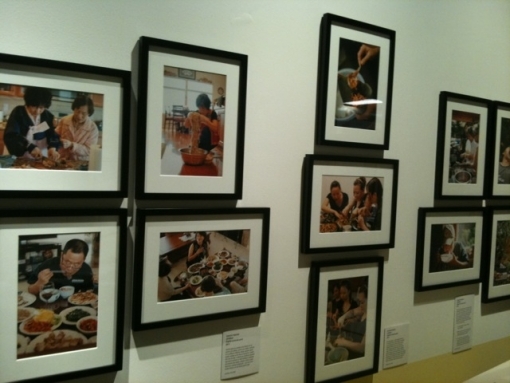 From Fields to Family: Asian Pacific Americans and Food, is the recently opened special exhibit at the Wing Luke Museum of the Asian Pacific American Experience, located in the heart of Seattle’s Chinatown/International District. The interactive show explores the significance of food in the history and everyday lives of APIA communities in the Pacific Northwest, as well as the influence and contributions APIA fare and labor have made to the economy, culture, and palate of the region over the last 150 years, where currently, “a steaming bowl of pho is as easy to get as a cup of coffee.” From the first Hawaiian sailors in the 1780s to the second wave of Vietnamese, Lao, and Cham in the late 1970s, the exhibit also showcases the variety of roles APIAs have played both as consumers and producers in the food industry -- from farmers to cooks to political activists. From Fields to Family takes the viewer through a series of themes, ranging from food as the centerpiece of immigrant family life to its place in holistic medicine. The show also covers the multiple stages of food from farm to table: harvesting, preparing, distributing -- and of course, enjoying. 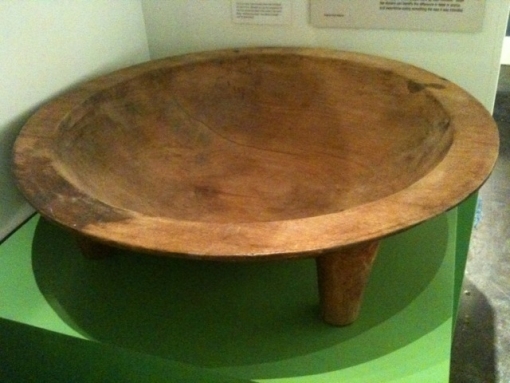 The exhibit opens with a dinner table complete with a lazy susan and the implements of an array of APIA cultures, including a dolsot (Korea), katip khao (Laos), and tiffin (India). Next is a look at early farm labor and family farms. In the 1800s, Chinese were the first field laborers, joining Natives, Blacks and whites and often used as a wedge between white and Mexican farmworker organizing. Immigrant foreman Ah Bing grafted two cherry varieties to create the Bing cherry -- which today is the highest grossing American cherry variety. Various fruits, vegetables, and seafood were brought into mainstream Northwest cuisine by early Punjabi and Issei farmers, who learned cultivation from local Native American tribes. Nissei farmers also harvested oysters, and an original oyster rake is displayed at the museum, prongs dangling from the ceiling. The Kiyohara family was the first to supply mixed salads, for example adding in purple cabbage for the University of Washington's orders. Today, there are over 90 Hmong family-operated farms in Washington, many of whom sell produce and flowers in the Pike Place Market. The processing, packaging, and shipping stages are also presented, with local examples of a tofu factory, butcher shop, and fortune cookie and noodle-making. Also considered are the backbreaking labor and long hours, as well as often complex supply chain and middlemen involved. With a large emphasis on the politics of food, From Fields to Family touches on issues of food justice, sustainability, and security, as well as the history of discrimination and subsequent activism for fair wages and safe working environments. The exhibit acknowledges the Chinese driven from the fields of Washington and Oregon and the incarceration of Japanese American farmers, as well as the workers in today’s orchards and tract farms. An original “Iron Chink” plate is featured (a machine that guts and cleans fish for canning and was marketed as a replacement for Chinese workers), alongside black and white photographs of Filipino fish processors (“Alaskeros”) who formed the Cannery Workers’ and Farm Laborers’ Union in 1936 in response to segregation and poor treatment. Similar items are displayed, leading up to the 2010 Grocery Store Workers’ Bill of Rights. truck -- which serves up Korean-Hawaiian style street food. Asian grocery stores have also had a presence in the Northwest for over 100 years. Uwajimaya, one of largest Asian markets in region, got its start in 1928, with owner Fujimatsu Moriguchi selling fish cakes out of the back of his truck. Viet Wah was the first Southeast Asian supermarket in the area, which opened in the late 1980s. Naturally, the exhibit gives ample attention to the family domain, and the cultural transmittal and household cohesiveness that happens during mealtime -- whether gathered around the kitchen table or at the family business. The familiar smells, sounds, and sights of meals are not only particular to an APIA culture, but to each individual family and how they have adapted in an American immigrant context. Ceramic jar to hold duck, chicken, or quail eggs. 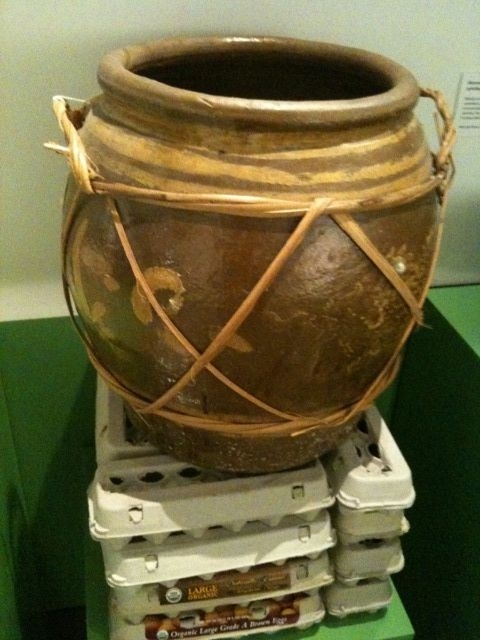 This one can hold over 200 eggs (China). The Wing Luke is a community-based museum, meaning that instead of a curator, exhibits are developed and created by Community Advisory Committees (CACs). The From Fields to Family committee was comprised of food critics, farmers, restaurateurs -- even a food scientist. CAC member and UFCW Local 21 Director of Special Projects Sharon Maeda (who knew the Kiyohara family) said: “At the first meeting, we had so many ideas. Some things that we wanted to include were missing from the Museum’s collection, so we just started calling people in the community for pictures, utensils, and the like.” The result is that, much like entering a family kitchen for a meal, the exhibit feels intimate and inviting. While I would have liked to have seen more examples of APIA relationships to contemporary food sustainability issues and the slow food movement, From Fields to Family is a dense, multi-layered exhibit full of (n)oodles of well-researched material and analyses. Like a good meal, the exhibit provides abundant variety and leaves the viewer feeling satisfied. On display through July 15, 2012. The Wing Luke Museum is located at 719 S. King Street in Seattle. For more information about the exhibit go here or call (206) 623–5124.